THE Blackwater franchise gave its ultimate tribute to the late big man Gilbert Bulawan after formally retiring his playing jersey on Saturday. A short and simple ceremony honoring the 29-year-old power forward out of San Sebastian, who passed away two weeks ago, preceded the PBA Governors Cup game between the Elite and NLEX Road Warriors at the Mall of Asia Arena. Bulawan’s no. 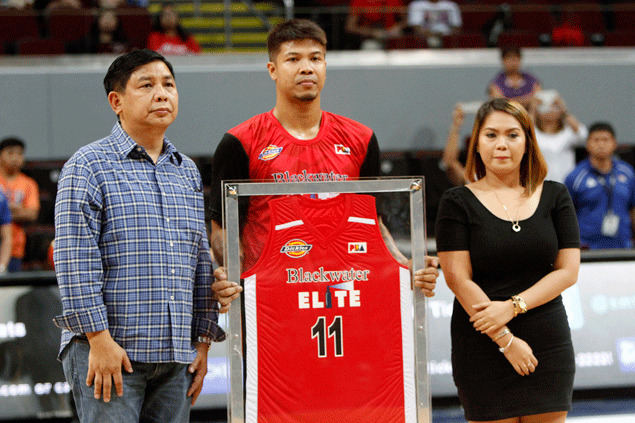 11 red jersey Blackwater uniform was officially retired and encased in a specially-made glass frame. Receiving Bulawan’s retired jersey was his wife Dr. Icey Bulawan, who was later joined at center court by Blackwater alternate board of governor Siliman Sy and Blackwater stalwart Riel Cervantes. It was Cervantes who happened to be the last player Bulawan approached and hugged before he collapsed at the SGS gym floor last July 3 just when the Elite were about to wrap up its afternoon practice. He later died at the Capitol Medical Center. Sy said the team dedicated the game against the Road Warriors in memory of Bulawan, who is known as Blackwater's 'Mr. Energy.' Unfortunately, the the team lost its first game in the season-ending tournament against NLEX, 96-90.